Arsenic (chemical symbol As, atomic number 33) is a notoriously poisonous metalloid. It comes in many allotropic forms, of which the yellow, black, and gray forms are regularly seen. It is sometimes found in its elemental form in nature, but it is usually combined with metals in various minerals. Given its high toxicity and the ease with which it could be used surreptitiously, arsenic was used in history by murderers, including members of the ruling class, to gain wealth, position, and power. It was therefore called the "king of poisons" and the "poison of kings." Some arsenic compounds—such as arsenite and arsenate salts—have been used as agricultural pesticides and herbicides. Other compounds, particularly sulfides of arsenic, were formerly used as pigments in paints. Also, wood treated with chromated copper arsenate, known as "CCA timber," was heavily used over the past 50 years as a structural material that resists rot and insect infestation. Two drugs (Salvarsan and Neosalvarsan) that were historically successful in treating syphilis and trypanosomiasis contained arsenic. Most of these applications have somewhat fallen out of use because of the toxicity of the materials. Nonetheless, newly designed arsenic compounds are being used for special applications in recent years. In particular, gallium arsenide is an important semiconductor used in integrated circuits, and appropriately formulated arsenic trioxide was recently approved for treating certain types of cancer. Also, monosodium methyl arsenate (MSMA), a less toxic, organic form of arsenic, has replaced the use of metal arsenates in agriculture. Arsenic contamination of groundwater is a problem of concern in certain geographical locations. The World Health Organization recommends a limit of 0.01 milligrams per liter of arsenic in drinking water. Consumption of water with higher levels of arsenic over long periods of time can lead to a condition known as arsenicosis and eventual death. Researchers have devised tests for arsenic in water and ways to remove the toxic material before the water is supplied for consumption. Arsenic is sometimes found in its native (elemental) form, but it is usually combined with iron, cobalt, nickel, antimony, silver, or sulfur. 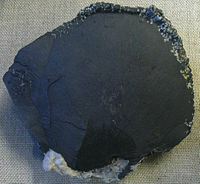 The most common mineral of arsenic is arsenopyrite, also called mispickel (FeSAs). When this mineral is heated, the arsenic sublimes (goes directly from the solid to the vapor state), leaving ferrous sulfide. Other arsenic minerals include orpiment, realgar, mimetite, cobaltite, erythrite, and annabergite. These minerals are inorganic compounds of arsenic. In addition, arsenic occurs in various organic forms in the environment. Inorganic arsenic and its compounds, upon entering the food chain, are progressively metabolized to a less toxic form of arsenic through a process of methylation. Arsenic compounds have been known since ancient times. During the Bronze Age, arsenic often occurred as an impurity in bronze, and it hardened the alloy. The word arsenic can be traced back to the Persian word زرنيخ zarnikh (for yellow orpiment), which was adapted in Greek as arsenikon. Albertus Magnus is usually credited for being the first to isolate the element in 1250. Methods of preparing the element were published by Johann Schroeder in 1649. The alchemical symbol for arsenic is shown below. As the symptoms of arsenic poisoning were not easily distinguishable from other medical conditions, and it could be used discreetly, arsenic was frequently used as an agent for murder. Its use for this purpose declined after the English chemist James Marsh perfected a sensitive chemical test (the "Marsh test") to detect its presence. In the periodic table, arsenic is located in group 15 (formerly group 5A), between phosphorus and antimony. It is thus a member of the nitrogen family of elements, sometimes called the pnictogens (or pnicogens). It lies in period 4, between germanium and selenium. Elemental arsenic is found in two solid forms: yellow and gray/metallic, with specific gravities of 1.97 and 5.73, respectively. When heated rapidly, it oxidizes to arsenic trioxide; the fumes from this reaction have an odor resembling garlic. The element and some of its compounds can also sublimate upon heating, converting directly to a gaseous form. As it is chemically very similar to phosphorus, arsenic will partly substitute for phosphorus in biochemical reactions, thereby poisoning the living organism. Multiple isotopes of arsenic are known, but nearly all of them are radioactive, with extremely short half-lives. Only one isotope, 75As, is stable. Arsenic has been proposed as a "salting" material for nuclear weapons—that is, as an agent that could increase the radioactivity of the weapon's fallout for several hours. Such a weapon is not known to have ever been built, tested, or used. Arsenic acid (H3AsO4): This is the acid form of the arsenate ion, AsO43-, a trivalent anion. The chemical properties of arsenate salts are similar to those of the phosphates. Arsenic acid is used in wood treatment, as an agent for finishing glass and metal, in the manufacture of dyestuffs and organic arsenic compounds, and in soil sterilants. It can moreover be used as an herbicide, insecticide, or rodenticide. Arsenous acid or arsenious acid (H3AsO3 or As(OH)3): This weak acid occurs in aqueous solution. It can be prepared by the slow reaction of arsenic trioxide with water. Addition of base converts the acid to arsenite ions [AsO(OH)2]-, [AsO2(OH)]-2, and [AsO3]-3. Reactions attributed to aqueous arsenic trioxide are due to arsenous acid and its conjugate bases. Arsenic trioxide or white arsenic (As2O3): This toxic substance is the main starting material for arsenic chemistry and the most important commercial compound of arsenic. It can be prepared by burning arsenic in air, or by the hydrolysis of arsenic trichloride, or by roasting arsenide minerals. It is an amphoteric oxide, but tends to exhibit mainly its acidic properties. Its various uses are outlined below. Arsine (Arsenic Trihydride AsH3): It is a flammable, pyrophoric (spontaneously igniting), and highly toxic gas that is soluble in water and various organic solvents. It is generally prepared by the reaction of As3+ sources with H− equivalents. It can be decomposed to hydrogen gas and elemental arsenic, and it can be oxidized (with oxygen) to produce arsenic trioxide. Its reactions with fluorine and chlorine (or some of their compounds) are extremely dangerous, as they can result in explosions. AsH3 is well known in forensic science because it is a chemical intermediate in the detection of arsenic poisoning. The old (but highly sensitive) Marsh test generates AsH3 in the presence of arsenic. Also, the Gutzeit test for arsenic involves the reaction of AsH3 with silver ions (Ag+). Some of its recent uses are noted below. Gallium(III) arsenide (GaAs): It is an important semiconductor and is used to make devices such as microwave frequency integrated circuits (Monolithic Microwave Integrated Circuits, or MMICs), infrared light-emitting diodes, laser diodes, and solar cells. Some of its electronic properties are superior to those of silicon. For instance, GaAs devices can function at higher frequencies (above 250 gigahertz), generating less noise, and can be operated at higher power levels. Also, it has a direct band-gap, so it can be used to emit light. Lead hydrogen arsenate, lead arsenate, or lead acid arsenate (PbHAsO4): It was the most extensively used arsenical insecticide—first used against the gypsy moth in Massachusetts, as a less soluble, less toxic alternative to then-used Paris Green. It was used mainly on apples, but also on other fruit trees, garden crops, turfgrasses, and against mosquitoes. "Basic lead arsenate" (Pb5OH(AsO4)3) was used in some areas of California. The search for a substitute was commenced in 1919, when it was found that residues of the substance remained in the products despite washing their surfaces. Alternatives were found to be less effective or more toxic to plants and animals, until DDT was found in 1947. The use of lead arsenate in the United States continued until the mid-1960s. It was officially banned as an insecticide on August 1, 1988. Lead hydrogen arsenate was used well into the twentieth century, as an insecticide on fruit trees. Regrettably, this application resulted in brain damage to those working the sprayers. Arsenic trioxide is a starting material for the manufacture of arsenic-based pesticides (sodium arsenite, sodium arsenate, and sodium cacodylate), herbicides, pharmaceuticals (Neosalvarsan), and veterinary products. It is also a starting material for the preparation of elemental arsenic, arsenic alloys, and arsenide semiconductors. It has been used as a wood preservative and as a decolorizing agent for glasses and enamels. It is also used to treat leukemia in patients who have not responded to other medications. Due to its toxic nature, drugs containing this compound carry significant risks. Scheele's Green (copper arsenite) is recorded as having been used in the nineteenth century as a coloring agent in sweets. Copper(II) acetoarsenite was used as a green pigment known under various names, including Paris Green and Emerald Green. It was also used as a rodenticide, insecticide, and blue-green colorant for fireworks. It caused numerous arsenic poisonings. In the last half-century, monosodium methyl arsenate (MSMA), a less toxic organic form of arsenic, has replaced lead arsenate's role in agriculture. Wood treated with chromated copper arsenate ("CCA timber" or "Tanalith") was heavily used during the latter half of the twentieth century as a structural and outdoor building material, in areas where there was a risk of rot or insect infestation. Although this type of treatment has been banned in many countries (see Precautions below), CCA timber is still being used. During the eighteenth, nineteenth, and twentieth centuries, a number of arsenic compounds were used as medicines. Arsphenamine (Salvarsan), developed by Paul Ehrlich, and neoarsphenamine (Neosalvarsan) were used for the treatment of syphilis and trypanosomiasis. These drugs have been superseded by modern antibiotics. Arsenic trioxide has been used in various ways over the past 200 years, but most commonly in the treatment of cancer. In 2000, the U.S. Food and Drug Administration approved this compound for the treatment of patients with acute promyelocytic leukemia, in cases of resistance to the drug ATRA (all-trans retinoic acid). It was also used as Fowler's solution in treating psoriasis. Gallium arsenide is an important semiconductor material used in integrated circuits. Circuits made using the compound are much faster (and much more expensive) than those made using silicon. It can be used in laser diodes and LEDs to directly convert electricity into light. Also used in bronzing (imparting a bronze-like surface to materials) and fireworks. Arsenic contamination of groundwater has been reported to occur in various parts of the world. The most notable case, in the late twentieth century, was that of a massive epidemic of arsenic poisoning in Bangladesh and neighboring countries. This arsenic is of natural origin, being released from sediment into the groundwater due to anoxic (oxygen-deficient) conditions of the subsurface. The groundwater began to be used after Western non-governmental organizations began a massive, tube-well drinking-water program. The program was intended to prevent people from drinking bacterially contaminated surface waters, but it unfortunately failed to test for arsenic in the groundwater. Many other countries in South and Southeast Asia including Vietnam, Cambodia, and Tibet—are thought to have geological environments similarly conducive to the generation of high-arsenic groundwaters. The northern United States, including parts of Michigan, Wisconsin, Minnesota and the Dakotas, are known to have significant concentrations of arsenic in groundwater. Arsenic can be removed from drinking water through co-precipitation of iron minerals by oxidation and filtering. When this treatment fails to produce acceptable results, more of the arsenic can be removed by using specialized media to which arsenic will bind. Several such "adsorptive media systems" have been approved for point-of-service use, based on a study funded by the U.S. Environmental Protection Agency (EPA) and the National Science Foundation (NSF). Arsenic and many of its compounds are especially potent poisons. They inhibit the normal action of enzymes in the body and disrupt various metabolic pathways. These metabolic interferences lead to death from multi-system organ failure. The World Health Organization recommends a limit of 0.01 milligrams per liter (mg/L) of arsenic in drinking water. Consumption of water with higher levels of arsenic over long periods of time can lead to the condition known as arsenicosis—chronic arsenic poisoning. Its effects include changes in skin color, formation of hard patches on the skin, skin cancer, lung cancer, cancer of the kidney and bladder. It can also lead to gangrene. The application of most concern to the general public is probably the use of CCA timber, mentioned above. After studies showed low-level leaching from in-situ timbers (such as children's playground equipment) into the surrounding soil, CCA timber was widely banned. Currently, the most serious risk is presented by the burning of such timber. Recent years have seen fatal animal poisonings and serious human poisonings resulting from the ingestion (directly or indirectly) of wood ash from CCA timber. (The lethal human dose is approximately 20 grams of ash). Scrap CCA construction timber continues to be widely burnt out of ignorance, in both commercial and domestic fires. Safe disposal of CCA timber remains patchy and seldom practiced. Some are concerned about the widespread landfill disposal of such timber. The European Union has classified elemental arsenic and arsenic compounds as "toxic" and "dangerous for the environment." It lists arsenic trioxide, arsenic pentoxide, and arsenate salts as category 1 carcinogens. Growing the Brake (fern) Pteris vittata will remove arsenic from the soil. ↑ Karen H. Antman. (2001). The History of Arsenic Trioxide in Cancer Therapy. Introduction to a supplement to The Oncologist 6 (Suppl 2): 1-2. PMID 11331433. ↑ Andrew Meharg, Venomous Earth: How Arsenic Caused The World's Worst Mass Poisoning. Macmillan Science, 2005. All links retrieved April 15, 2016. Contaminant Focus: Arsenic by the U.S. Environmental Protection Agency. Environmental Health Criteria for Arsenic and Arsenic Compounds, 2001 by the World Health Organization. This page was last modified on 15 April 2016, at 15:48.